Add an extra layer of protection to your entryway. Adding a storm door to your entryway will not only help to protect your front door but can also boost the curb appeal of your home. Homeowners in Des Moines and throughout the state can turn to Home Solutions of Iowa for storm doors that are built with exceptional craftsmanship and are backed by a lifetime warranty. Plus, our skilled technicians will install your storm door correctly so that it functions properly well into the future. In addition to being sturdy and energy-efficient, the storm doors we install are also beautiful. They feature baked-on high gloss paint that is highly resistant to wear and tear. Plus, if you get a new entry door from us as well, our storm doors are available in exactly matching or complementary colors. Furthermore, you will be able to choose the amount of ventilation you want in your storm door by selecting screen or glass options. Glass options include Low-E and tinted glass, and screen options include heavy-duty pet screens or solar guard screens. And, you will also be able to choose the decorative finish for your lock and hardware. 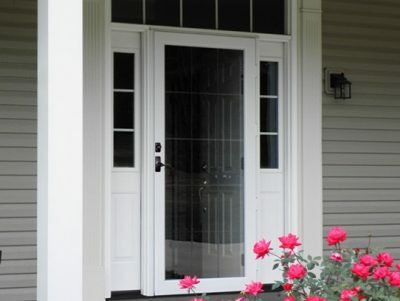 To learn more about the storm doors we have available, contact Home Solutions of Iowa today. We will be happy to schedule a complimentary consultation at your home in Des Moines or elsewhere in the state.